The Moonee Valley 2014/15 Sixths Premiership team got together to reminisce over a great season with a weekend away at Queenscliff from May 11 to 13. Thanks to skipper Brett Curran for his hospitality, and for guiding the crew to the Queenscliff Brewhouse, where they set up base for much of the weekend. Only Peter O'Kane and Paul Edwards were missing from the premiership team, so the bond between the premiership players is evident. 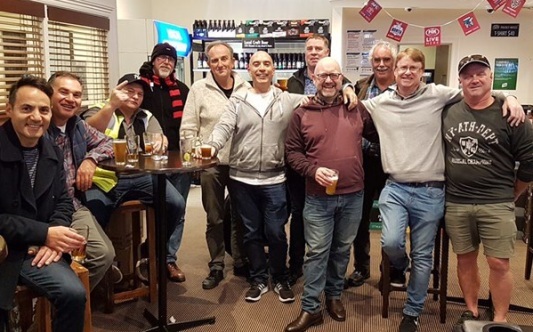 At left: The Premiership team get-together: L-R Sam Carbone, Dean Jukic, Mark Gauci, Kevin Gardiner, Brett Curran, John Talone, Norm Wright, Paul Hobbs, President Charlie Walker, Dean Lawson and Sean O'Kane. About half of the players have hung up the boots since the premiership, but a stirring presentation by Mark Gauci on the Friday night has got most of the boys raring to pull on the whites again for 2018/19 - although their wives don't know it yet! A bumper crowd of almost 90 packed the Moonee Ponds Club for our 2017/18 Presentation Night, and it provided a great opportunity to honor our own. With Club founder Ray Storey and wife Heather as our honored guests, Moonee Valley bestowed three Life Memberships and awarded the prestigious Lindsay Jones award to Michael Ozbun. Sean O'Kane, not known as a regular at the microphone, delivered a magnificent and inspirational address on receiving his Life Membership plaque, epitomising what makes Moonee Valley such a great club. We also awarded Life Memberships to two players who have come all the way through juniors - Matt Thomas and Jesse Felle - and it was also fitting that Chris Ayers was at the April 14 night. Chris was the parent who founded our juniors in 1996, and we haven't looked back. At right: Two great new life members - who also played together in the 2009/10 Firsts Premiership - Sean O'Kane (left) and Matt Thomas. In our Silver Jubilee year of the Lindsay Jones Best Clubman award, Michael Ozbun became just the third person to win it more than once. Of course, there were plenty of trophies for milestones, batting, bowling and fielding and other achievements. Grahame McCulloch, who first played in 2007/08, had a few seasons off then came back, took to the stage to give a whimsical review of his career, as he's retiring to Tasmania. At left: Great clubman Michael Ozbun (right) receives his Lindsay Jones award from President Charlie Walker. 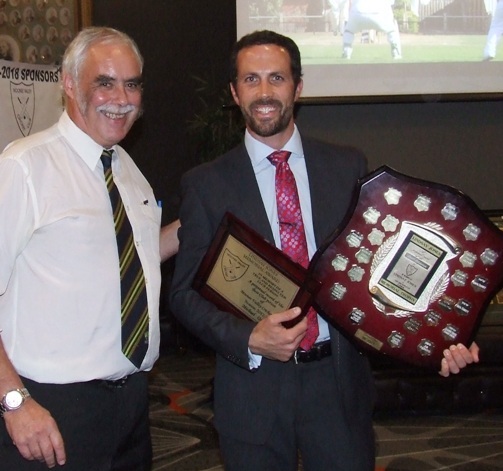 Grahame, who started as the dad of a junior, was best known for his fielding and for his role in the Sixths Premiership in 2013/14. We've already told him to bring his whites whenever he comes back across Bass Strait. 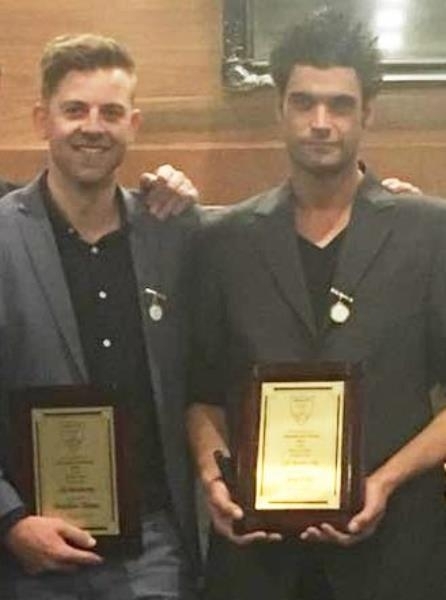 Chanaka Silva won the Club Champion award for the second consecutive year, while Jesse Fellewon the Moonee Valley Award for the best player in all other grades. Jesse just pipped young gun Joshua Norsetter, who as a 13yo carried all before him in the Fourths. Jesse and Josh both finished the season with 37 wickets, although Jesse played a lot more games as a result of the double-up rule. The winner of the Bendigo Bank Most Improved Player, as decided by the coach, was Nigel Cowan Jnr. His win was announced and trophy presented by his father Nigel Snr - a valued member of our Committee. Channa DeSilva won the Wicketkeeper of the Year award - announced and presented by Brendan "Jonty" Rhodes. 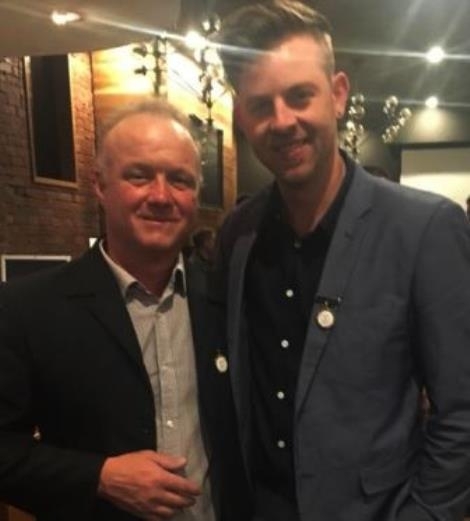 It was fitting that juniors founder Chris Ayers was at the night with wife Vicki, as milestones trophies were presented to two players whose junior connections go back to that very first year. Chris' son Daniel Ayers, who was in the Under 12s in our inaugural junior year, received his 50 senior game milestone, having come back this season after a hiatus of more than 10 years. At right: Matt Thomas and Jesse Felle (far right) proudly wear their Life Member badges. And Richard Cooney, whose son Michael was also an inaugural Under 12, received his 100-game milestone trophy. Matt Thomas and Jesse Felle are the first two players from our junior program to achieve the honor of Life Membership. Both have established excellent careers over a long period of 16 senior seasons, while our bylaws - which recognise longevity of service in determining Life Membership, take into account 50% of junior games in helping meet the criteria of 200 games and 16 seasons with our Club. Dual Premiership captain Mark Gauci received a trophy for playing his 300th game - just the fifth Moonee Valley player to achieve that honor. Matt Thomas and Dean Lawson received recognition for 4000 runs, and Jim Polonidis and Jesse Felle reached the 350-wicket milestone. We gave it our best shot! Moonee Valley went down fighting in the North A1 Grand Final, and in the final analysis we ran out of overs after Day 3 was washed out. Our Firsts overcame a mid-season slump to finish third of the ladder, and a strong Semi Final showing carried us through to the Grand Final. But a couple of moments on the first weekend - when we let Sunshine off the hook after having them 8 for 116, and then losing two wickets in the second-last over of the first day's play - meant we struggled to gain the ascendancy. 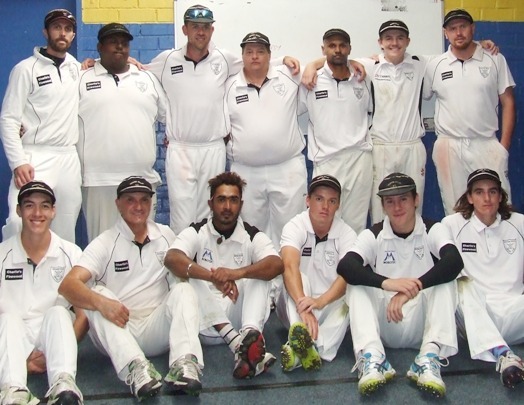 At right: Our Grand Final team: L-R. Back - Michael Ozbun, Channa DeSilva, Matt Thomas, Mark Gauci, Rajan Aiyappan, Charles Bibby and Nate Wolland. Front - Nigel Cowan, Lou Raffaele, Chanaka Silva, Daniel Comande, Jack Newman and Anthony Cafari. We considered ourselves a big chance after the first weekend, but losing the whole of the second Saturday's play to rain changed the complexion of the game. Instead of having to scrap and fight for 160 overs, Sunshine knew it only had to defend on the last day - and attacking shots were few and far between. The March 17, 18, 24 and 25 Grand Final was held at the Sunshine YCW ground, Kinder Smith Reserve in Braybrook. Moonee Valley Cricket Club is based at Ormond Park in Moonee Ponds.. We have seven senior sides - four on turf and three on hard wicket, and a range of Saturday and Sunday games to suit all options. Anyone interested in joining our successful and progressive club for next season can phone Club President Charlie Walker on 0411 705 381. Let's get on target - no more dropped catches!